David McCullough’s biography of John Adams holds an honored spot among my favorite books and is the only biography on my list. I found the work enlightening for author McCullough’s very readable insights into the second president’s life, the historical events in the early years of the United States, and John Adams’ courtship and marriage to Abigail Adams. What haunted me long after reading the last page, however, were the many letters between John and Abigail the author incorporated into the biography that added so much to the narrative. In fact, I can’t imagine the work without the letters. McCullough is not the only one to have delved into the correspondence between the two. Numerous writers, biographers, and filmmakers readily acknowledge the debt they owe to the correspondence for information about the couple and their times. The letters are incredibly intimate and as I read them I as if I were trespassing. But they also revealed the beauty of both writers’ writing (even when some of the letters are mere notes dashed off as someone waited to carry the letter between the two) and they reminded me of the degree to which we have lost the art of correspondence. Of course, the two had no other means to communicate their state of mind during their many and long separations as John Adams traveled the country. In much of their early correspondence, especially during courtship, John and Abigail used pen names in their writing. In Abigail’s case, though she signed her letters A. Smith (her maiden name), she used the Roman goddess of the moon’s name Diana when referring to herself; and John used the name Lysander after a Spartan warrior. This reads quaintly today but adds a touch of whimsy to the letters. I shudder to think of what two young lovers or BFFs might write to each other today, whether email or twitter, perhaps the only “written” communication left. I wonder if the Adams’ were prescient, referring to each other as “Dearest of Friends” (DOFs?) throughout their lives even after marriage. It is in reading words like these, I’m reminded to pause and think before dashing off a note, whether typed or handwritten. And I’m challenged to elevate my own writing. Thank you David McCullough. Thank you Abigail Adams. Note: In some instances spelling was corrected and capitals eliminated for readability. Paul Coehlo said it’s part of the human condition to want to share things—thoughts, ideas, opinions. At least, that’s what the web says Paul Coehlo said. After Facebook came Twitter, more sharing albeit in bite-sized chunks, and Pinterest, and Instagram. Who knows where it will end. The phenomenon of sharing, however, has allowed me to find others who, like me, have taken the phrase Postcards from Wonderland for their own. My third find in this quest (see posts #1 March 22, 2015 and #2 May 26, 2015) was Sue and Alison’s blog, A Postcard from Wonderland. In their blog, the two young women share thoughts about their day to day lives as they once would have done through handwritten letters sent in the mail and more recently though email. Both, for all intents and purposes, would have been private communications. Reading their posts is a guilty pleasure, like the time I read my sister’s diary—what was she thinking, that a tiny latch would keep her most intimate ten year old thoughts from prying eyes? It was a temptation I couldn’t resist. So here now are the private words of two friends on view for all. Sue and Alison once lived near each other in Canada but today are separated by many miles; Sue lives in Geneva and Alison in Belfast. Still they share several interests. They both love stumbling on artistic treasures for the home, whether they found the items in flea markets, antique stores, or thrift shops, or handmade by friends or relatives. In small, self-created postcards, they share images of their finds, snapshots of their worlds, and intimate photos of family, including a number of a pregnant Sue with her mother and months later, Sue’s infant in arms and Alison’s son at various stages and poses. I thank Sue and Alison for sharing and for giving all their followers a view into their lives. I hope they keep the correspondence going—one day it will amount to a book, if books survive, where two women share their hopes and fears, successes, and failures, life as it comes to them head on. Until then, “Back to Porridge” a phrase Alison says she learned in Northern Ireland. It means, “Back to Work” or in my case, “Back to Writing”. Though I am skeptical of awards, things like the Oscars or Emmies and even the Nobel Prize for some of its more questionable honors or honorees (IMHO of course), I was delighted with the awarding of the 2013 Nobel Prize for literature to Alice Munro. Her stories–ashamedly, I’ve only scratched the surface–portray everyday people from anytown North America. I say North America, though as a Canadian writer her settings are undoubtedly Canadian, they are a universal place. In these small towns, people go about their day-to-day existence until interrupted by something seemingly ordinary. The tension running below the surface, often from the very first sentence, promises to transform the ordinary to the extraordinary. Ms. Munro crafts her stories in words and a language palpable to readers from all walks of life and all manner of backgrounds and origins. In the lead story to “Runaway”, she writes of the “…leaves overhead sending down random showers even in those moments when there was no actual downpour from the sky and the clouds looked like clearing.” We’ve all experience those moments, but, a few pages later, we’re catapulted into a scene as far from normal as it can be. “The fog had thickened…transformed itself into something spiky and radiant. First a live dandelion ball, tumbling forward, then condensing itself into an unearthly sort of animal, pure white, hell-bent, something like a giant unicorn, rushing at them.” It is these juxtapositions that draw us in with the familiar then turn on us and beg us to reach to understand. Simple and complex. A joy to read. Unfortunately for her public, I read that at age 82, Ms. Munro claims to have written her last stories. I imagine there are many more bottled up in her head, stories that only she will know, both simple and complex. Before too much time passes, I wanted to share a short piece I wrote in honor of fathers and daughters or more precisely, my father and a memory I had to share with him on the most recent Father’s Day. Please share a special memory of your own! Baking did not come naturally to me. I once took a gourmet cooking class and managed to turn out several wonderful three and four course meals, but only by blindly and exactingly following the instructions. On this year’s Father’s Day, I found myself in the midst of a project to bake and photograph a number of recipes handed down by my grandmother, among them: a white cake with coconut frosting, sugar cookies, Kuchen, a German Chocolate Cake, and date bars, a perennial family favorite. As I was stirring the flour into the whisked eggs for a batch of date bars, a voice in the back of my head whispered, “The dough is awfully thick.” Yes, it’s supposed to be, I thought, swatting at the nagging voice. “It’s not the right color.” I know, it does look a tad too yellow, but maybe that’s because I used fresh farm eggs, I said and then proceeded to the next and last step, which was to fold in the stiffly beaten egg whites. “Fold in,” the voice reminded me. I can’t, I replied, the dough is too stiff. Go away. I’ll use my fingers. Okay, it’s still a little stiff, but I’ve gone too far to start over. Anyway, I did increase the portions for dates and pecans—the best parts—so never mind. Off it goes, into the oven. Thirty minutes later, I removed the hardened near-brick like square of dough from the oven. I’d have to visit my father on Father’s Day empty-handed. I was crestfallen. I’d used up all the dates and pecans I had on hand so there was no way to bake another batch. What to do. What to do. I decided to try to try to make lemonade from my lemon. I let the batch cool, sliced it into squares, and then dusted the bars with several heaping spoonfuls of powdered sugar. I bit into one. “It’s not very sweet,” the voice said. “It’s a bit hard.” Hard, yes, but not impossible to chew—just shy of a biscotti I thought optimistically. I looked back over the recipe to see where I’d gone wrong. My grandmother knew what to do when but never thought to include those details. So, I should have blended the vanilla with the milk before adding the milk to the dough. I should have used whole milk rather than the healthier non-fat variety. And, worst of all, I’d omitted one very important ingredient altogether, sugar. The recipe called for a cup and a half. What a disappointment. The failure reminded me of a day almost fifty years ago. I was maybe ten years old and was attempting to bake a cake “on my own”. I don’t remember what type of cake, but likely another of my grandmother’s recipes. It was also likely that both my grandmother and mother were present to lend a helping hand should I need one. I was determined, however, to prove I could do it without help. After carefully following the instructions, I slipped my two cake pans into the oven and sat back to wait. Thirty or forty minutes later, with an oven mitt on each hand, I reached in the oven and removed the cake pans, carried them gingerly to the counter and then flipped them over. Two brown discs hit fell to the counter with a thud. I’d forgotten the milk. I could barely look at the cake though I’m certain my siblings had and that they promptly doubled over with laughter. I sobbed. Shortly, my father came in to the kitchen, immediately saw how devastated I was. He took a slice of one of the circular pieces of firm dough, how he managed to cut it I don’t recall, and gobbled it down. He went for another and exclaimed how good it was. I think I cried even harder. If I remember correctly, he finished the whole “cake”. Now, I glanced down at my date bars and put another spoonful of powdered sugar on each. I was taking them to my father who I knew would eat them and declare them “the best”. I’ll begin by posting one of my own short stories — inspired by my mother who visits my writing regularly. Emma had a way of getting what she wanted. In 1937, only months after her fifteenth birthday, she wangled her way onto the pages of The Evansville Courier, the town’s daily newspaper. The column heading on page six of Friday’s edition read “Local Art Student Has Big Plans”. Below, in a photograph centered on the page, a dark-haired young girl with what appeared to be even darker eyes posed beside her easel. Beautiful might not have been the word Emma’s friends used to describe her, but few found a better word to explain what it was about Emma that drew their attention. Slightly built, she stood a hair over five feet tall and was wafer thin. Perhaps too thin, but Emma compensated for her minor physical flaws with her sense of style like sporting the latest ankle-strapped platform shoes that added three inches to her frame and her deft use of makeup, a dab of mascara or a splash of red lipstick that guided eyes to her best features. Then, too, she had a way with words. It wasn’t what she said so much as the way she said it, confidence oozing from her alto voice. Emma used words, phrases, tones, and mannerisms as deftly as she used a cosmetic brush. “Yes, true . . .” Miss Perkins said her voice trailing off. It’s not really a lie, just a slight exaggeration, Emma thought. Emma’s mother had embroidered or beaded a number of the wedding gowns Lynette Macy described in her duties as society columnist. Once, Miss Macy had even mentioned Christine Dillon by name. Miss Perkins needed little encouragement, she was already half wound around the young girl’s finger. Emma was attentive in class and never failed to volunteer to help Miss Perkins or any of the other teachers from whom she might need a favor someday. Regardless of who actually requested the interview, on Thursday, March 15, John Gartner, a reporter from the Courier, arrived to interview Miss Perkins and her star pupil. Emma looked up from where she stood beside an easel. She gave the reporter a sideways look, her dark eyes, half-hidden by a strand of ink-black hair, held John’s glance. Emma dabbed her brush on the canvas then wiped the sable hairs on a cloth. “I already am an artist,” Emma said drawing back to assess her work. She selected another brush and then bent closer to the canvas, squinting at a spot where she wanted to add detail. Faint lines creased the soft pouch of skin between her eyebrows. With a slow, deliberate stroke, she applied a dab of alizarin crimson to the canvas. “You’re not from the society news column are you, Mr. Gartner?” Emma said, not taking her eyes off her canvas. “Unless of course someone buys the painting before then,” Emma said. John rose from his chair and stepped behind Emma where he could watch her work. He said nothing but followed the young girl’s steady hand as she corrected the outline of an apple in the bowl of fruit she was painting. Emma leaned back again, this time twisting her head one way then the other. Finally, she turned, looked up at Mr. Gartner, arching one of her carefully penciled eyebrows as she scanned his face. “Ahem,” John cleared his throat and stepped back. He returned to his chair. “Well, let’s see, where was I? Yes, I can see you are indeed an artist.” He eyed the tip of his pencil, bringing it so close to his eyes Emma feared they would stick where they crossed. Then he licked the point as if buying another second to gather his thoughts. Emma sensed the reporter’s discomfort. She wiped the brush clean and placed it in the paint box, rolling her fingertips against the brush handle until it found the groove. She too was drawing out the moment. John inspected the painting and nodded his approval of another rendering of a bowl of fruit. John stared down at the blank page in his notepad and scratched a few words. An hour later, the reporter exited the school, his notebook in his pocket and a canvas tucked under his arm. The article John submitted featured the young student—the spring art benefit received only a passing mention. His article was not the last Courier article to feature Emma. Three years later, on Friday afternoon, Emma sprinted the short distance home from school. She doubted her father had bothered to read the day’s society column and feared he might have disposed of the paper already. She was right. She retrieved the paper from the waste bin in the kitchen and flipped the pages. Nine, ten, she counted silently. There! On page eleven, smack in the middle of the page sat a photo of her dressed as Sadie Hawkins. Emma was again the subject of an article in the Courier—this time for her part in the high school’s annual play. She scratched through the utility drawer in the kitchen until she found a pair of scissors. Then, with short, precise snips, she clipped the article from the paper, careful not to lose a detail, not a single strand of blue-black hair, or the toe of her shoe. Emma read the article four times and the last line several more. The author reported the young woman had given up painting for singing, dancing, and acting, and, it said, she had “big plans” for her future. Emma shook Ben Livingston’s hand. “Thank you, Mr. Livingston. You won’t regret your decision.” It’s a first step, Emma thought. I’m on my way. 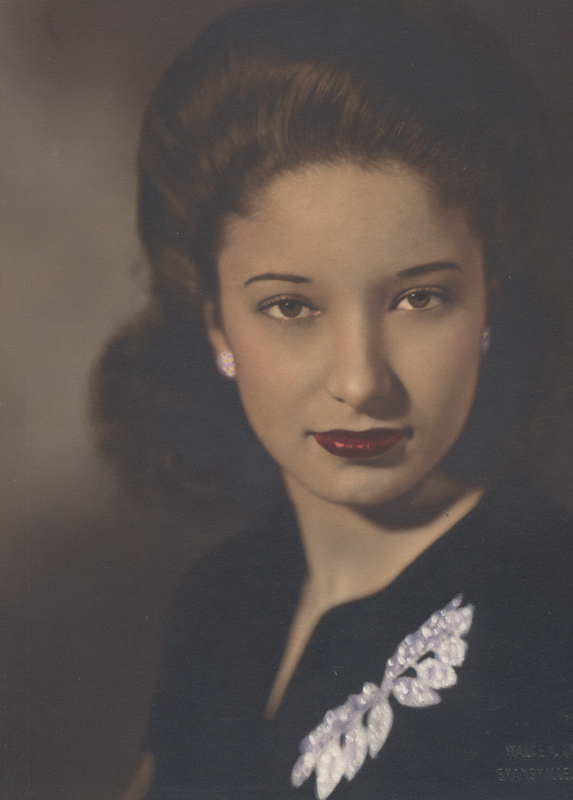 She’d graduated with Central High School’s class of 1940, been voted Most Likely to Succeed, and landed her first job. Not bad. Not bad at all. Emma snapped out of her daydream and followed Ben downstairs to the Regency Theater’s lobby and to the brightly lit glass bubble encasing the ticket booth. Betty, Mr. Livingston’s bookkeeper, rose and stepped aside to let Emma take the seat behind the tiny counter. As the two men headed inside, Emma caught a snippet of their conversation through the still open door to the ticket booth. “Isn’t she a looker?” Ben said. “Does she have any experience or references? She looks kind of young?” Harvey said. “I’m not sure, I guess we got sidetracked. I’ll check on her in a while though,” Ben said. Hollywood’s most eligible bachelor was coming to Evansville for the local release of Jesse James, his latest film. Ben and Harvey had arranged a dinner for Tyrone and his entourage and had succeeded in convincing the star to appear, even if only briefly, at the Regency beforehand. “I wouldn’t miss it for the world. You can count on me,” Emma said. Although she doubted needing a reminder, she dug through her purse to find a pen and notepad. She scribbled the date and circled it twice. “See you next Saturday.” Emma waggled her fingers over her shoulder before disappearing around the corner. For the next five days, Emma could talk of nothing else but the upcoming event, trying the patience of both her mother and father. On Thursday after dinner, she bounded down the stairs no less than three times to model a different outfit. “What do you think?” Emma twirled around, striking a pose to give her reluctant audience views of the front, side, and back of her ensemble. “They’re all fine, Emma. You look fine in each of them,” her father said. Emma, however, already preoccupied with selecting the perfect accessories for her outfit, was halfway up the stairs, her heels clicking against the bare wood. “Miss, Miss,” one of the two young girls standing in front of the ticket booth cried. Inside, staring into her compact mirror, oblivious to the two, Emma checked to see that her lipstick was still fresh and her hair in place. The same girl, seeing no response from Emma, rapped her knuckles on the glass. Startled, Emma dropped her hands to her lap and put the mirror away. “Oh, yes . . . . Here you are. Two tickets. Thank you. Enjoy the film.” Her voice was monotone, robotic, and far from genuine as she recited the words Harvey had prescribed. As soon as the girls disappeared inside, Emma rose to see over the heads of the crowd assembled near the theater’s entrance. Ticket holders for the evening show milled around the entrance. Everyone had heard the Hollywood star would stop by the theater before the show. No one dared go inside and miss even a glimpse. At a quarter past seven o’clock, a long black car pulled in front of the theater. The crowd shuffled closer to the curb. “Oh, there he is. There he is,” someone said. “Ooh!” Several female voices squealed in unison. Bunched together, shoulder to shoulder, the crowd blocked Emma’s view. Even on tiptoes, she saw nothing but the backs of the throng. Then, three teenage boys approached the ticket window. On any other night, Emma might have flirted with them, but not tonight. She sped through the transaction and slid three tickets through the half-moon slot in the glass. Emma fixed her eyes on the top of Harvey’s head, following the shine from his bald pate as he weaved through the crowd. A moment later, the top of another head appeared alongside Harvey’s. This head bore a crown of thick, dark hair gleaming with reflections from the marquee lights. A perfect, artfully drawn line parted the dark waves across the top; no single hair dared be out of place. It was him! It was him! Was this all she was going to see? “Please, please give us some room,” Harvey pleaded with the crowd. The crowd retreated two or three feet. People nearest the double door entry worked their way inside the theater, perhaps hoping for a better view there. Harvey and Ben succeeded in clearing a path. As they approached the theater entrance, they took up positions on each side of the screen idol to avert any sudden crush from the patrons, while also making certain they would be prominent in any photos in the morning papers. “Mr. Saunders, Mr. Livingston, this way,” a female voice said. Harvey paused for half a second. He blinked. Emma thought he looked puzzled, as if he did not recognize her with her hair pulled up and knotted in a chignon behind her head, a brash red on her lips. With one arm, she held open the nearest of the double doors and with the other she pointed the way inside. Harvey blinked again then turned back to his guest, ushering him inside. “Welcome, Mr. Power. Welcome to Evansville,” Emma said. Emma heard Ben but stood her ground. She had maneuvered herself successfully into view and intended to remain there as long as necessary for Tyrone to notice her. As the trio took another step forward, she smiled and lowered her eyes. With her free hand and its five perfectly shaped scarlet nails, she fingered the silver brooch she had taken from her mother’s drawer without asking. “Thank you very much, Miss . . . uh?” he said arching one black-as-night eyebrow upward on his forehead. “Oh Mr. Power, this er, this young lady handles our ticket booth. Emma, I am sure there are customers waiting to purchase tickets for this evening’s show,” Ben said. Emma watched as they disappeared, quickly swallowed by the swarm of onlookers trailing behind. She turned and walked back to the ticket booth. A line of theatergoers stretched along the sidewalk in front of the empty bubble.